Note: The Raven is an episodic game. As such, this review only covers the first episode of the game. Episodes two and three release in August and September, respectively. 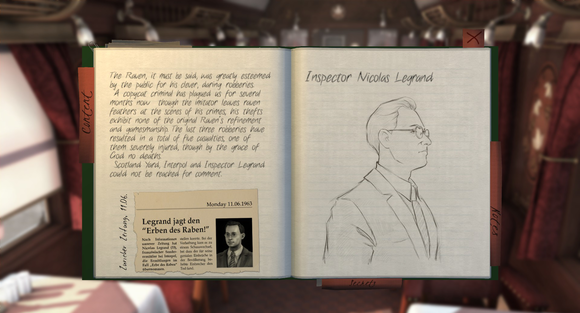 A Swiss cop, a famed Interpol agent, a resurrected (maybe?) master thief, and a dazzling jewel walk onto a train. No, it's not the setup to a lazy joke; it's the launching point for The Raven: Legacy of a Master Thief, the latest game from King Art, developer of Book of Unwritten Tales and other classic point-and-click adventure games. You play as Constable Anton Jakob Zellner, a charmingly naïve Swiss policeman trying to unravel the mystery of a recent jewel theft. Everyone agrees the theft was reminiscent of methods used by the titular Raven, a master thief who was killed four years ago. Except the man who killed him, an Interpol agent named Legrand, isn't so sure he killed the right person anymore. Has the Raven returned? Or is this just a different man in a Raven mask? Is this just a copycat thief? Or is the Raven back? For years we've been promised the opportunity to play as an “everyman” character. Naughty Dog touted Uncharted star Nathan Drake as an average Joe, and I hesitate to ask who those developers hang out with if their "everyman" is a mass-murdering psychopathic thief with the acrobatic skills of an Olympic gymnast. Constable Zellner is the most average of average Joes. He's a Swiss cop, but it's obvious from some of the comments other characters make that he's been passed over for promotion many times in the past, and why not? He's old, balding, rotund, with a charming naïveté that's lovingly out of place in a detective. Constable Zellner is an unassuming protagonist, but it's hard not to love his earnest charm. Zellner has some real moments of insight in the game, but he's not some superhuman cop with a loaded gun and a chip on his shoulder. He's eager to be a part of something, to work alongside his hero Inspector Legrand, to turn his love of mystery novels into real life experiences. You're basically playing as a Swiss Santa Claus, bumbling through the game with a litany of terrible jokes and a real small-town sincerity to your actions. And every character is crafted with this sort of care. To some extent these are caricatures more than real people—you’ve got your hard-nosed detective, the kid and his single mother trying to reconnect while on vacation, the German doctor who is either menacing or simply awkward around people, the bookish professor—but they’re all portrayed with warmth and passion. The game does an especially good job at depicting Zellner's relationship with Max, a young kid who you foster almost a grandfatherly relationship with. At one point, when you make Max mad and end up bribing him with some candy, I couldn't help but picture my own grandfather patiently trying to reason with my eight-year-old hellion self. In between all this character drama is a well-told mystery story that nails many of the cliches of 1960s and '70s adventure films—a dazzling jewel heist (or is it a caper? ), a chase across countries, and a legion of characters you don't quite trust. 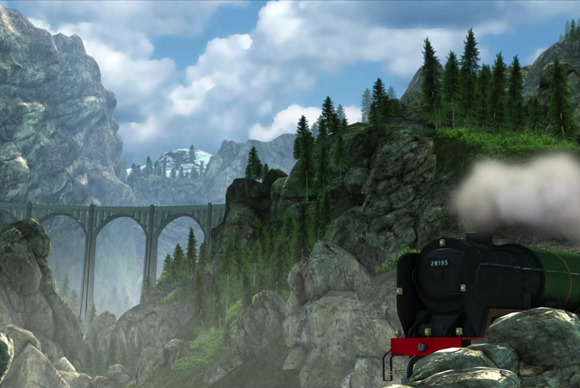 The opening of the game takes place en route to Italy by way of the Orient Express, if the game's influences weren't already clear enough, and it's a globe-trotting adventure from there on out. Cross-country train rides and guns in violin cases: The Raven embraces the touchstones of classic adventure movies. The score deserves special praise. It starts to sound repetitive after a few hours, but composer Benny Oschmann does a pitch-perfect '60s Disney impression. Think of the excessively upbeat, adventurous music in Mary Poppins, or even the Disney-esque Chitty Chitty Bang Bang. It instantly sets the mood for the game. I'm not going to claim The Raven revolutionizes storytelling in games—it doesn't. There are other games out there that do more with character and story, even inside the adventure genre (see The Longest Journey). However, The Raven is a glass of cleanish water pulled from a lake full of garbage. This isn't The Last of Us. The Raven is as charming and naïve as its main character, a romp that never gets too dark even when circumstances turn dire. The game addresses adult themes, but it does it with the soft gloves of a thrilling children’s bedtime story. At most, we’re talking Willy Wonka and the Chocolate Factory levels of discomfort. Sure, we can tell Gene Wilder is an absolute maniac, but we’re not left to dwell on it. It's just a shame The Raven isn't more fun to play. I should love the puzzle design in The Raven. In keeping with the setting, King Art claims all puzzles are “Hollywood realistic.” In other words, the world adheres to the same set of rules as films: heroes are never shot, you always solve the puzzle at precisely the right time, and household objects become the most skillful of tools in your nimble hands. This realism actually renders the ridiculous leaps of logic required in adventure games even more apparent than a fantastical setting. Since The Raven takes place in realistic locations, the fact that you can't solve puzzles in a logical way is especially disconcerting. For example, one puzzle required me to craft a torch so I could see better. Having seen a few movies in my day, I know I probably need to wrap some sort of wooden object with a piece of fabric, douse it in oil, and then light it on fire. Easy, right? I’m in a train surrounded by plush upholstered chairs, luxurious curtains, and various other accoutrements. But of course the game only allows me to pick up one specific curtain. Why? Because adventure game tropes, I guess. Normally the challenge—and frustration—of playing adventure games lies in figuring out the solutions. The Raven is even more frustrating because I know exactly what to do each time; the game just won't let me do it. There’s a hint system if you really get stuck, but the puzzles are easy enough you shouldn’t ever have to use it, except when you can’t make the leaps of logic the game requires and need it to spell out precisely which gewgaw you need to click to progress. Zellner takes down clues in his handy-dandy notebook. The Raven also makes some weird concessions in favor of realism. At one point your character has to carry around a fire axe, and I mean that quite literally: each time you stop and examine something, he puts down the axe, examines the object, and then has to pick the axe back up again. Would it make sense for Zellner to put the axe in his pocket? Maybe not, but at least it wouldn’t stall the pacing. An interrogation is far less scary if your captor wears a yellow polo shirt. And that’s one of the game's biggest problems. In keeping with that 1960s globe-trotting mystery film setting, the stakes of the game are always rising. There are quite a few moments where you take control after a dramatic cutscene and—presumably—race against time to solve some puzzles. You wouldn’t know it, though, from the way Zellner dawdles through the environments, stopping to provide useless comments on the scenery and have extended conversations with tangential characters. In real life, my Zellner would have died a dozen times over simply because he refuses to run anywhere, even in an emergency. It’s hard to know how The Raven will shape up over the course of episodes two and three. The developers claim you’ll change characters at some point, playing as “the villain” of the game. It’s an interesting premise, but I’ll miss ol’ Constable Zellner when the switch happens. As it stands now, The Raven is a perfect afternoon jaunt. It’s not the best or the deepest adventure game, but it’s got a lot of charm and well-defined characters. If you’re an adventure game fan, well—you’re probably going to pick this up anyway because there just aren’t that many new adventure games being made these days. Otherwise, maybe hold off until episodes two and three come out to see whether the narrative arc remains strong and satisfying throughout.